MPWH.com is one of the most popular dating websites caters to help people living with herpes (HSV-1, HSV -2) to find romance and relationship. MPWH is also well known as Meet People with Herpes. Unlike other STD dating websites which accept all kinds of STD singles, MPWH only provides support and dating service for herpes singles. MPWH used to be a unique herpes dating website, but it was acquired by the largest STD dating site PositiveSingles.com in 2012. And now, MPWH is a sub-brand of PositiveSingles which runs independently. MPWH has more than 210,000 members around the world and the majority of the members are from the United States, Canada and the United Kindom. MPWH used to be a totally free herpes dating site. Members of this dating site were very active due to it’s free. But, in March 2016, it started to charge members for its dating service. However, there is no limitation for people to browse profile, post blog, send free winks and reply to paid member’s emails. But, if you want to initiate an email, you need to upgrade to the gold membership(Premium membership). The membership fee is $29.95 per month which is same as PositiveSingles’. 2. 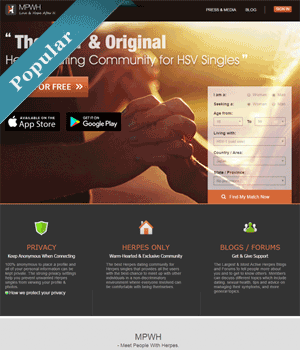 Herpes Dating App – Offers dating app for IOS and Android user. MPHW knows users are very careful about their personal information. Your personal information and profile information will not be sold to any third party. Members’ profile will be only available for registered members. Besides, MPWH has more options for profile setting- you can choose to hide your profile to all members or just make it visible to the people whom you like. For a 1-month membership, you need to pay $29.95, which works out to $1.00 per day. For a 3-month membership, you need to pay $59.95, which works out to $19.95 per month. For a 6-month membership, you need to pay $95.95, which works out to $15.95 per month. Obviously, the average prices of 3 or 6 months packages are much cheaper than 1 month, if you do not know whether this herpes website site works for you or not. I suggest you pay 1 month first(remember to turn off the auto-renewal after paying,), then you can choose to unsubscribe the paid membership or continue to use it and pay for 3 or 6 months package based on your experience. Please note that there will be an auto-renewal for the 1-month membership. MPWH is one of the best herpes dating sites. But compared with PositiveSingles.com, the number of members are not enough in some area. If you already have an account on PositiveSingles.com, you could have a try on this website. Otherwise, we highly recommend you try the largest STD PositiveSingles first. Next story What Are The Side Effects Of Valtrex?